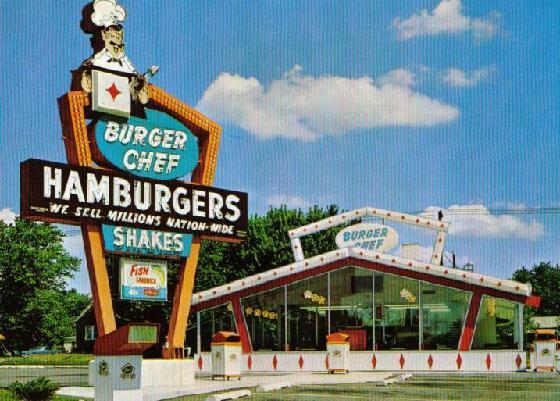 Burger Chef is gone now, but as a kid, I would rather go there than McDonald's because Burger Chef had the WORKS bar. You could order your burger totally plain (or maybe you had to?) and then trotted over to the condiment bar and did it up yourself. Here's an ad teaching Americans of the 1970s how to use the Works bar. Incrediburgible! Where I lived (Grand Rapids, MI), we had a McDonald's, Burger King, and Burger Chef, all side-by-side on the main drag. Given a choice I ALWAYS chose Burger Chef! I loved them as a kid. We moved away from Grand Rapids when I was 12, I never saw another Burger Chef again. I didn't realize how much I missed them! I grew up in Farmington Michigan (A suburb of Detroit) and there was a Burger Chef behind the gas station where I worked through high school. I'd always go to BC on my breaks. ttle Sandy burger that was pretty good, with steak fries. Those were the days! !